Tazeen Chowdhury of Mt. Lebanon School District is traveling to Washington to discuss healthy school meals with federal lawmakers. Tazeen Chowdhury gets schoolchildren to eat avocados and edamame. That bit of miracle-working earned her an invitation to testify this week before a Senate committee on Capitol Hill in Washington, D.C. She joined this week to enlighten lawmakers about the tricks she uses to get students in the Mt. 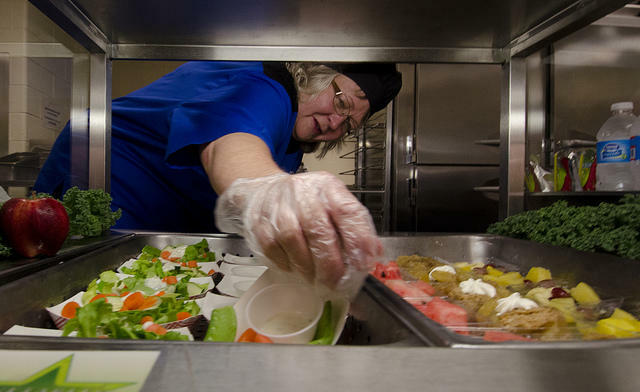 Lebanon School District to eat better and healthier both on and off campus. Chowdhury said students gobble up newer food choices like avocado, kiwi and edamame. “Our salad bar gets wiped out,” she said. “[Students] are eating all kinds of different varieties of foods, so we have firsthand knowledge that all of the new nutrition standards have been working here." Her trip to D.C. comes as the Senate considers a bill to renew the National School Lunch Program and the School Breakfast Program under the Improving Child Nutrition Integrity and Access Act of 2016. Chowdhury met with Republican Rep. Tim Murphy, Republican Sen. Pat Toomey and Democratic Sen. Bob Casey Monday and Tuesday to share examples of how Mt. Lebanon is successfully implementing healthier foods into school meals. The National School Lunch Program and School Breakfast Program are federal meal programs with strict nutritional guidelines that offer subsidized meals to American schools. Healthier nutrition standards for school meals went into effect in 2012, and recent statistics from the U.S. Department of Agriculture show 86.8 percent of Pennsylvania schools are meeting the new standards. Chowdhury said she was invited because Mt. Lebanon has been “ahead of the curve” in implementing healthier foods in their schools. “It’s nice to know that legislators and policymakers want to hear from people in the field who are actually planning the menus and preparing school lunches,” she said. Mt. Lebanon also offers students and parents taste testing events for new foods, as well as recipe cards to take home. The district consistently scores among the highest on state achievement tests and draws from one of the wealthiest tax bases in Pennsylvania. Chowdhury said she hopes Mt. Lebanon can be an example to lawmakers of how schools can properly implement a nutritional food program. “The cafeteria is an extension of the classroom where students can learn to eat healthy and be exposed to a variety of whole different foods,” Chowdhury added. Congress’ support is crucial at advancing children’s health, she said. “By actually going there and telling our success stories, we’ve been able to prove that these regulations do work, and keeping children’s health in the forefront is the biggest priority,” she said. U.S. Sen. Bob Casey (D-PA) is supporting a bill to correct the “WIC gap” in which young children who receive assistance are left without nutritional assistance before entering school. In Pennsylvania, children are eligible for the Women, Infants, and Children program until they reach age 5 – then its assumed they enter school where they may qualify for the school breakfast and lunch programs that provide them with food. The not-yet-approved Clean Vehicle Corridors Act is the most recent of the many federal and state efforts to push for the use of alternative fuel vehicles in the United States. On June 22, U.S. Sen. Bob Casey (D-PA) re-introduced his bill, first introduced in 2013, which would allow the Department of Transportation to establish clean vehicle corridors along interstates nationwide. The corridors would provide spaces for fueling and charging stations, travel plazas, rest stops and other roadside infrastructure. Two Pennsylvania senators convened a field hearing on opiate abuse Thursday at Allegheny General Hospital in an effort to jumpstart support for a bill filed in July.